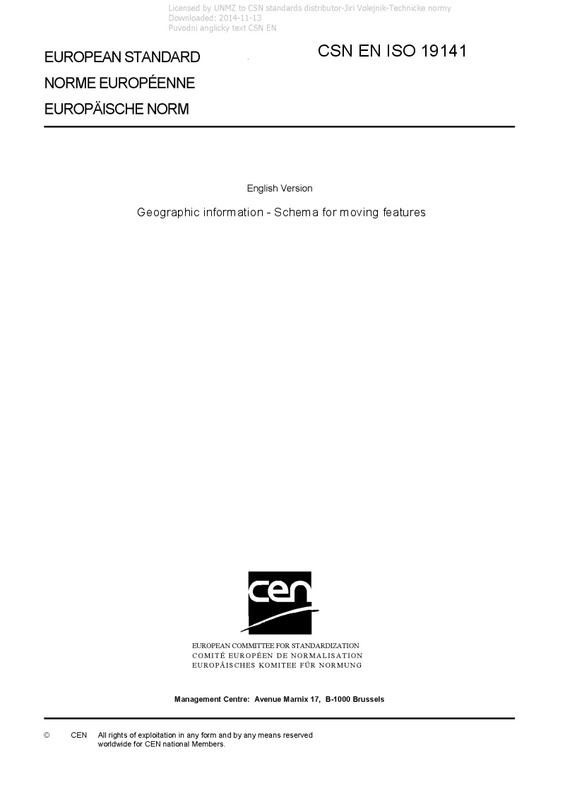 EN ISO 19141 Geographic information - Schema for moving features - ISO 19141:2008 defines a method to describe the geometry of a feature that moves as a rigid body. Such movement has the following characteristics. ¦The feature moves within any domain composed of spatial objects as specified in ISO 19107. ¦The feature may move along a planned route, but it may deviate from the planned route. ¦Motion may be influenced by physical forces, such as orbital, gravitational, or inertial forces. ¦Motion of a feature may influence or be influenced by other features, for example: ¦The moving feature might follow a predefined route (e.g. road), perhaps part of a network, and might change routes at known points (e.g. bus stops, waypoints). ¦Two or more moving features may be “pulled” together or pushed apart (e.g. an airplane will be refuelled during flight, a predator detects and tracks a prey, refugee groups join forces). ¦Two or more moving features may be constrained to maintain a given spatial relationship for some period (e.g. tractor and trailer, convoy). ISO 19141:2008 does not address other types of change to the feature. Examples of changes that are not adressed include the following: ¦The deformation of features. ¦The succession of either features or their associations. ¦The change of non-spatial attributes of features. ¦The feature's geometric representation cannot be embedded in a geometric complex that contains the geometric representations of other features, since this would require the other features' representations to be updated as the feature moves. Because ISO 19141:2008 is concerned with the geometric description of feature movement, it does not specify a mechanism for describing feature motion in terms of geographic identifiers. This is done, in part, in ISO 19133.